Sandalwood is by far our most popular incense. 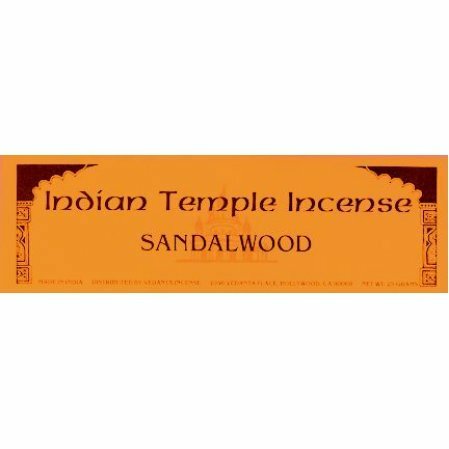 Sandalwood is by far our most popular incense. It is a light incense especially treasured by those who do not care for the more common sweet and heavy incense. This fragrance is part of our Indian Temple Incense brand. We sell the original formula which we call "sandalwood classic." It is available both in the 25 gram regular size and as a 100 gram bundle. We may have to send the incense separately. In this case, the estimated shipping charge will be low. Thanks again for the quick service and your great selection of incense varieties. The Sandalwood is probably my favorite and the delivery was swift. Always a pleasure to do business with the Vedanta Society. Wonderful people, wonderful products, and great service! My orders are always shipped quickly. This is a staple in my home, have used it for over 40 years. Recently a friend said my yorkie smelled of sandalwood. Good stuff! This is the best incense ever! I have been delighting in it for over 50 years! These incense are wonderful. They smell great and burn much longer than any others Iâ€™ve purchased. Thank you!! We used it when I lived at Ananda Ashram eleven years ago and I still use it now. I love it. We use this incense for arati at our yoga center exclusively. I also use it at home. Our Guru says it is the most spiritual sandlewood available! This incense is delightful, delicate, comforting. I love it. As always I am very pleased with this purchase as I have been using this same incense since the late 60's. This smell reminds me of the day of my initiation that my spiritual master lit one of this sticks. It is the traditional woody smell of real sandalwood, not of artificial quality, but pure and natural sandalwood. You will never repent of choosing this brand and smell. It is so wonderful and the smell lasts days in the environment of my special place. This is surely the best Sandalwood Incense ever! Smells wonderfully potent, and the scent lingers on for literally days. Very pleased with my purchase! Please don't stop carrying this wonderful product. This is by far the best smelling incense EVER. I hope they never stop making this scent... It is quite Heavenly and Divine. Makes you feel re-energized and very centered at the same time. Just a lovely, happy fragrance! Have been ordering all fragrances of the Vedanta incense for 30 or 40 years. Their quality and scent are the best in the world that I have used. The Vedanta press business has always been fast, reliable, honest, and has consistently kept a high standard in every way. Try some of their incense and books. You will like them. Always pleased with this incense, not too strong or sweet, just right. Brings me back to ashram days of sacred space. Your beloved incense has helped me achieve higher planes of existence through meditation since I was a young man of eighteen, some forty seven years ago. i really like this new flavor. Wonderful. Perfect as always. Not to strong, not too weak. Just right. Transports me back to the Vedanta Centre in Cohasset, MA. Thank you thank you thank you. Returning to a fragrance that held my highest moments.. being centered in the Santa Barbara Temple at Vespers. I am very grateful that this incense is still being made and is easily available. This signature fragrance is identical to what it was many years ago. I have been using this incense for many years, and the quality has always been great! This has become the only incense I burn now. It calms and renews!! Pure incense, a familiar product. I am glad you stock it. I have used this for many years. Still one of the best out there. I love it. I've been burning incense for 20 years. Sandalwood is my favorite. I've tried many. The Vedanta ranks in my top two. I have been using this same incense since 1974. This is my most favorite and for all these years it is always the same fragrance which for me is very calming and peaceful. My grand children call this Grandmas smell which they love.